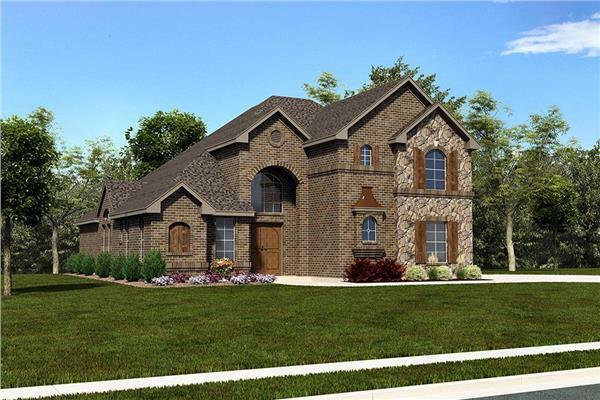 Give your family room to grow in one of these spacious and luxurious house plans 3,000-3,500 square feet. Every year the average American home increases in size, with more and more families across the country seeking to expand their living spaces to make room for new children or aging in-laws – or simply to accommodate hobbies and home businesses. Upgrading to a larger home allows owners to plant roots without the stress and headache that comes from outgrowing a smaller home – such as shared bedrooms and waiting for the bathroom in the morning. Nothing is worse than forming memories in a home, only to be forced to move out a few years later because there just isn’t enough room for everyone. Our selection of 3,000-3,500square foot floor plans features between 3 and 5 bedrooms, so you can rest assured that you’ll have enough space for large families of any size or configuration. With the larger layout of the home, the homes differ in depth and width so you can find one that’s sure to fit your lot. Many homeowners choose these larger house plans to accommodate grown children that decide to move back home (often as they start families of their own), allowing for the creation of an entirely new set of memories to be formed. Another common feature of homes this size is an ample number of bathrooms, some of which are part of master suites or form an ensuite with large bedrooms. The generous amount of space in home. also allows for a bigger living room and dining room, along with garages or carports to store multiple vehicles. These plans are typically one to two stories, and are available in a countless amount of styles. Browse through our 3000 to 3500 square foot house plans to find the home of your dreams.